Scoop and Au received a huge bag of imported cat biscuits from a friend last week but are they happy? No! When I brought the bag home, our fuzzies sniffed around it, admiring what was clearly a present for them. We set the humongous bag aside, waiting till they finished their own bag of crunchies. When the new bag was opened yesterday morning, their precious majesties sat down to enjoy their expensive treats. And guess what? It's a unanimous yeck! Au came downstairs and gave us a sad look. Scoop marched around, pushing us to look at his cat bowl, and then saying mia-ow which clearly meant, "What is this stuff and where are our proper biscuits?" So the strays outside are enjoying a mega bag of biscuits, and I went to the supermarket this morning to load up on their favourite Gourmet biscuits. Cats can be really unpredictable and ungrateful. Just as well they'e gorgeous! Au woke me up at 2AM with a very quiet meow. Touching me gently with a soft paw I could see his eyes were huge. Obviously he was shocked to his fuzzy core. I followed him to the bathroom and saw what had upset him: his biscuit bowl was empty and his water dish had been defiled by a cat biscuit. I remedied the situation, and he gave me a brief rub against the ankle to show me he was happy again. At 615AM Scoop came marching in, sing meow meow mrauf and purring like a small engine. He had cool fur and wet feet, a sure sign that he’d been out for an early morning walk. Clearly invigorated, Scoop decided he needed a big breakfast. Ignoring Scoop is not an option. I staggered out of bed, went to the kitchen and gave him a bowl of chopped chicken liver. Scoop sat down with a happy MAUF and started eating. Au appeared out of nowhere and joined him, chatting happily. Obviously they realized they had caught me at both ends of a night’s sleep because when I got up at 8 o’clock both cats were waiting for me. They kept me company while I showered. Supervised while I made coffee, and are now sitting on the office rug, purring loudly and squeezing their eyes when I look at them. PS in case you’re interested, this year is the Year of the Boar. If you’re celebrating, take a look at the Year of the Boar New Year Online Treasure Hunt. Au is in the Star today looking extremely handsome. Unfortunately I spoke too quickly. Yow-Yow is back at the front of the house AND eating his biscuits around the back too. I'm pondering ways to keep him at the back because the home invasions he stages upset Scoop and Au. If anyone has any ideas, please share! As for the tarot card reading... I've read Au's horoscope a few times, and Scoop has sat for his as well but so far the readings are rather vague. We're enjoying it however and will keep at it. Wishing you an auspicious and properous Year of the Boar. I've written two online treasure hunts to help kids (and older kids!) sharpen their online research skills. These first two are all about Chinese New Year. If they prove popular, I'll write another one about cats! Remember I was pleased when The Cat Formerly Known For His Dirty Face finally settled in at the back door? Everything seemed to be going well, and we even renamed him a third time last week, calling him Yow Yow as this is what he says when he calls round for snacks. But the little so-and-so emerged from the back lane last night, marched round the front, broke into the house, and caused havoc. Scoop was furious, Au was shattered, and my sleep went completely out of the window when the bloodcurdling screams rang out at 2AM. It's obvious cats don't know the meaning of Valentine's Day. I shall go and take a bit of chicken outside, and while the fuzzies are enjoying a snack, I'll grab the opportunity to give them a lecture on the concept of love. And the joys of silent nights. PS For those of you who are new to the blog and don't know Yow Yow, here he is. Scoop is Not Speaking. He's been taking his medicine every day and is getting better, but he is annoyed with me for dosing him twice a day. This morning he gave me an evil look, said meeOW! in a very marked manner, and stomped off. I will have to buy him a roast chicken as a peace offering. Two raised voices shouting MAUWWWOW and SHHHHHAW just before 8 o’clock this morning blasted me out of a comfortable snooze. Neither voices sounded like Scoop or Au but as the fuzzies were not in bed, I worried. I called for them, and heard Scoop give a soft throaty meow from upstairs. Tom had snuck off to the upstairs office at the crack of dawn to tinker with the last few chapters of his book; Scoop was obviously keeping him company. Old fuzzy sent down a message to say he was not involved in the fracas taking place outside. Au then appeared in the doorway, fur coat all fuzzled up, eyes wide with interest – clearly a cat who had fallen off the sofa and rushed to see what was happening without even the slightest attempt to pat his stripes into place. Giving a small good morning squeak, Au then dashed over to the window, and peered out excitedly. We soon realized the noise was caused by The Cat Formerly Known For His Dirty Face confronting the fuzzy Persian looking fluff from the end of the road. As TCFKFHDF tends to stick to verbal fights, I left Au to his window watch post and went back to sleep. I’ll check TCFKFHDF for scratches when he comes for afternoon biscuits, and give him a lecture on the value of good neighbourly relations, but I suspect it won’t do much good. Cats will be cats. 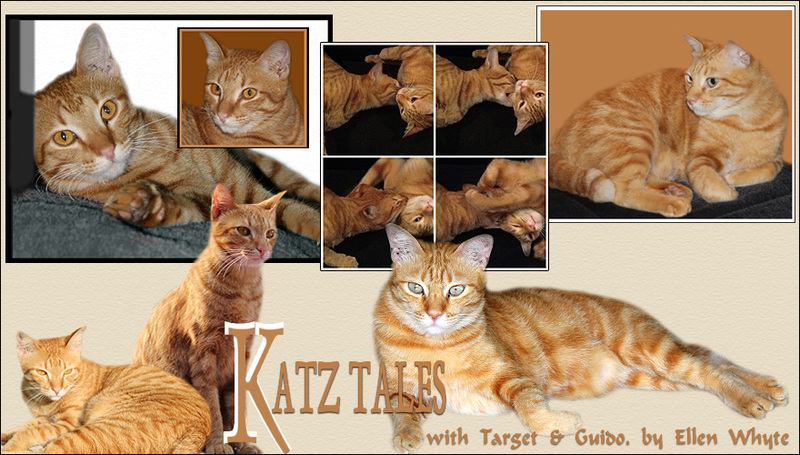 PS Katz tales is out in the print edition of The Star Weekend section tomorrow. PPS Here's Scoop and Au, tails entwined, sitting companionably on their rug. Serving as guards, pets, guides, and general factotums, dogs have also contributed to the English language. to find out more about doggy expressions, check it out!